There’s an epidemic slowly taking over the world like a frosting of ice disguised in an animated storyline and catchy songs about snowmen and freedom. If your household is remotely similar to mine then it should be no surprise Frozen references are found every where, every day and I’m starting to worry this movie is completely taking over our lives. ONE -- We introduced Madison to her first chapter book with Frozen. We knew the movie would be part of her Easter basket so we wanted to seize the opportunity of reading the story before watching it. Every night before bed her mother and I took turns reading a chapter (two chapters, if she asked) finishing the night before Easter. We like that Madison got to imagine the characters and settings before she actually saw them because, let’s be honest, books are almost always better than their movie counterparts anyway. 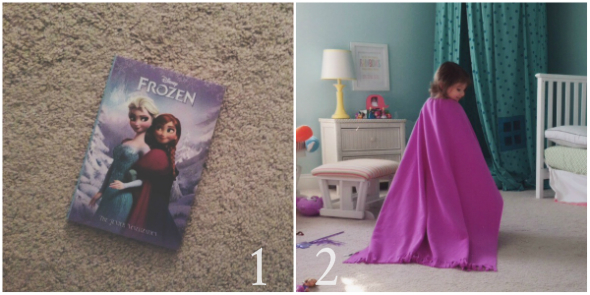 TWO -- After witnessing Elsa climb a snow covered mountain with her cape flying behind her in the winter wind she created, Madison wanted to do the same. She doesn’t have the royal violet threads of an ice queen hanging in her closet so she improvised with one of her favorite blankets that she has yet to use for its intended purpose since. The number of times I’ve fixed her cape rivals the number of times we’ve seen the movie and listened to the soundtrack… which is a lot. More often than not, the cape prompts singing or singing prompts the cape, either way they almost always happen in unison. 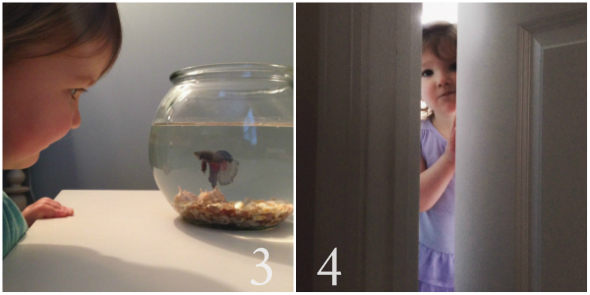 THREE -- For Easter, Madison asked for a fish and what kind of Easter Bunny could refuse to deliver on that request? Once the initial excitement of receiving said fish subsided, the task of naming it was presented in which she chose to name it Madison. Obviously, this choice could lead to confusion down the road especially considering she had named several other things Madison that same week so Allison and I invoked our parental veto and asked that she choose something else. She went with Sassafras only to change it to Elsa a few days later. FOUR -- In addition to watching the movie no less than several times a week and singing every song ten times that amount, we’ve now resorted to acting out the scenes. She’ll quickly shut her bedroom door and when her mother or I ask that she keep it open, we’re met with the response “go away, Anna” to which we have to retort by asking if she would like to build a snowman. We watch as she creates snow magic in the palms of her small hands standing in the middle of our living room and scream for help when she strikes someone across the temple with an invisible stream of ice and we do it all fairly often. 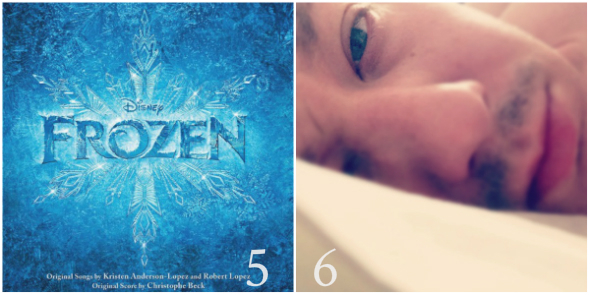 FIVE -- There is something worth noting about the Frozen soundtrack in that I fear there is some sort of subliminal, underlying message that encourages the listening and then singing of every song. On more than one occasion, Allison and I have both been guilty of singing along around the house or in the car or (in Allison’s case) in the shower as her and Madison fill the bathroom with the vocals of their very own Songs of Frozen concert. Madison knows every word to every song from every character in every scene and although her note selection could be considered a bit of a fixer-upper… if you will… her singing is probably my favorite part of this Frozen phenomenon. SIX -- After dressing like the characters and naming pets after them and incorporating their dialogue in our every day vocabulary (thank you, Frozen, for teaching my toddler the word fractal) and acting out scenes until our heads hit our pillows at night, she has started to wake us up in the same spirit of the movie. Last Saturday morning, she came into our bedroom and padded her bare feet across the hardwood floor stopping just in front of my still sleeping face before taking her index finger and her chubby thumb to pry one of my eyes open exclaiming the sky is awake so she’s awake so it’s time to play. So I did because, honestly, it would take a cold-hearted individual to argue with that logic. For more of Madison's random moments, follow me on Instagram. I feel like this is the first movie kids have been able to properly create fandoms over. It both excites and terrifies me, lol. We have finally reached the point that Frozen has started to fade into the background! So there's a light at the end of this tunnel? It's all day, every day around here... as I type this comment "Love is an Open Door" is playing in the background, no joke. Yes, I promise you, there is a light. But, as you probably know by now, it is distant. We saw the movie in theater when it first came out, watched it a few times as soon as it came out on DVD, and even saw it in 3D while we were in Qatar...so I feel your pain (only imagine the adorableness of both of your kids acting the scenes out together). Reminding them of other movies they liked, introducing new movies, and trying not to play the soundtrack in the car all helped us recover.